The Yale Peabody Museum will open its doors for a FREE, two-day festival in honor of Dr. Martin Luther King, Jr. and his efforts to ensure environmental and social justice among all people. The Yale Peabody Museum, 170 Whitney Ave., will host its 20th annual Dr. Martin Luther King, Jr.’s Legacy of Environmental and Social Justice on Sunday, Jan. 17, noon to 4 p.m., and Monday, Jan. 18, 10 a.m. to 4 p.m. In his tireless efforts to work toward equality for, and harmony between, all people, Dr. Martin Luther King, Jr. strove to raise awareness about public health concerns and urban environmental issues that disproportionately affect communities. In recognition of the progress that has been achieved in these areas, and with optimism for the future, we will celebrate with music, dance, children’s storytelling, teen summit, a community open mic and our annual poetry slams. On Sunday, Jan. 17, from noon to 2:30 p.m., join us for our 7th annual Teen Summit event celebrating the legacy of Dr. King. In this interactive workshop, teens from all over Connecticut will come together to participate with the dynamic motivational speaker, Hashim Garrett of Breaking the Cycle of Violence Through Forgiveness in an effort to promote social and environmental justice. On Sunday, Jan. 17, from 3 to 4 p.m., Mayor Toni Harp will address some of the challenges to our community on issues of education, racism, violence, gun control, and will share with us her vision for New Haven. An important component of this celebration is our Zannette Lewis Environmental and Social Justice Community Open Mic and Poetry Slam, on Monday, Jan. 18, from 11 a.m. to 4 p.m. The Community Open Mic is an exciting aspect of our festival that gives people a unique opportunity to honor the spoken word legacy of Dr. King by sharing original poetry. The Poetry Slam includes well-known poets from around the United States. For more information visit http://www.peabody.yale.edu/events. 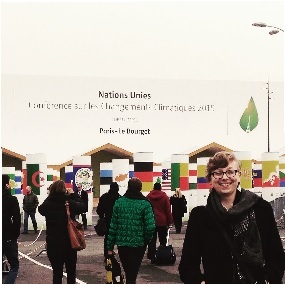 By the time you’re reading this, I’ll have been home from the COP21 climate talks in Paris for about six weeks. I attended the conference as an NGO observer, spending long days in the former-airport-turned-conference space running between meetings, negotiation sessions, press conferences, and approved “actions.” The 40,000+ attendees from nation-states, non-profits, universities, and, yes, the fossil fuel industry, came together for two intense weeks with the same goal—to leave with a global agreement to fight climate change, helped along by the four tons of free trade chocolate one environmental group distributed throughout the venue. But Paris produced what 20 previous conferences did not—a global agreement which seems set up for success. The major takeaway from COP21 is the coalescing around 1.5 degrees C of warming, rather than 2 degrees, providing climate finance to vulnerable countries, and a process to evaluate and ratchet up emissions reduction pledges. The theme of ending the reign of fossil fuels was central, from divestment actions to the planning for a global shutdown of fossil fuel infrastructure in May 2016. Keeping 80% of current fossil fuel reserves in the ground is essential if we’re going to come anywhere near meeting COP21 targets. In Connecticut, the battle is over the build-out of natural gas infrastructure, which will lock us into a fossil-dependent future for years to come. And on the national scale, ending fossil fuel subsidies must be a major priority—coal, in particular, wouldn’t be a viable choice without taxpayer dollars propping it up. So we leave Paris with a lot of work left to do, but with knowledge of what lies before us. For me, the biggest victory from COP21 are the relationships I formed with activists from Brazil to Switzerland. President Obama called the Paris Agreement the “best chance we have” to save the planet. I disagree. The international process has been happening nearly as long as I’ve been alive, and in that time we’ve seen global emissions rise by 60%. We can’t wait on our governments anymore. The true hope lies with the people. We’re ready. People Against Injustice is currently involved in several projects and newcomers are welcome to join us in our efforts. On November 19, PAI hosted Sen. Gary Winfield to discuss upcoming justice-related legislative initiatives. Sen. Winfield reviewed the package of justice reforms just signed into law. Going forward, a promising political climate appears to exist for slashing the prison population; raising the maximum age of juveniles to 20 (from 18); and bail reform, which would attempt to eliminate or curtail cash bail. PAI supports these efforts and will be focusing attention on the design of the Public Defenders system in Connecticut as well as how to boost its resources. PAI is also examining some problems that may be addressed by policy or rule changes rather than legislative reform, such as obstacles faced by minors attempting to visit family members in Whalley Avenue jail, and several rules and practices in the state courts in New Haven related to defendants’ rights. PAI’s NHPD Freedom of Information request: PAI has uploaded dozens of New Haven Police General Orders and procedures to the Internet in order to make these documents available to the public. They are the result of a Freedom of Information request that PAI submitted in October. PAI will be submitting a second request for confirmation of completeness, as the documents, though numerous, do not appear to be a complete set. The public can access, download and even comment on the data here http://tinyurl.com/PAI-NHPDdocs. Upcoming event: In the coming weeks, PAI will be announcing an event tentatively set for late January. To receive announcements, check our Facebook page periodically for an update, or send us your e-mail address. Our url is http://www.facebook.com/PeopleAgainstInjustice. PAI can be reached at peopleagainstinjustice@riseup.net. Save the date: The 22nd Women’s Studies Conference “#FeministIn(ter)ventions: Women, Community, Technology” will be held at Southern Connecticut State University Friday, April 15 and Saturday, April 16, 2016. Conference sessions will juxtapose global, comparative, inter-sectional, interdisciplinary and inter-generational perspectives for the collective re-thinking on women, community, and technology. Expect serious fun through meals and performance, with women, girls and their allies speaking of their struggles and power. Registration is required for attendance. Please email the Women’s Studies Program at WomenStudies@Southernct.edu or call (203) 392-6133 for more information on registering for this event. Be sure to visit the Women and Girls’ Fair while attending the conference. The fair will feature a number of local female-centric, female-owned businesses and organizations aimed to introduce you to local and regional handmade goods, gifts, crafts, and more. For more information on how to register as a vendor for the fair, please contact the Women’s Studies Program at (203) 392-6133 or email at WomenStudies@Southernct.edu. The Arts Council is pleased to announce the third round of support for creative community engagement projects: Arts Build Community. Artists and arts organizations are invited to submit proposals for projects that actively engage community members in the creative process. We believe that participatory art making experiences can have a profound impact on our community. They can enrich the quality of community life, enhance the lives of individuals, and build connections between people. Small project stipends of $1,000 to $2,000 will be given to selected projects. Deadline for proposals is January 15, 2016. Successful proposals will suggest project activities and events that reflect an understanding of the community or relationship with target audience. To review the complete RFP requirements and submit your application, please visit the Arts Council website at http://www.newhavenarts.org/seeking-community-engagement-through-art-proposals or email info@newhavenarts.org or call (203) 772-2788. Previous recipients include: Adam Christoferson’s Inspired Songs of New Haven, a song-writing project with youth, adults with mental illness, and veterans dealing with PTSD; an inter-generational drawing project led by the Free Artists of New Haven to create murals of Latino leaders in Fair Haven; a project inviting the public to create Symbolic Healing Objects for children at Yale New Haven Children’s Hospital; and a series of workshops at neighborhood libraries with the artist Krikko, where community members created portraits of their neighborhoods that will be displayed together as a neighborhood mosaic. Visit the Arts Council online at http://newhavenarts.org, call (203) 772-2788, like us on Facebook at http://facebook.com/artscouncilofgreaternewhaven, follow us on Twitter @newhavenarts, or Instagram @newhavenarts. #ArtEverywhereNHV. The City of New Haven has 45 different Boards and Commissions which are filled by over 300 New Haven citizens from all neighborhoods and all walks of life who volunteer to serve the city. These posts range from such highly visible assignments as the Board of Education, the Housing Authority of New Haven and the Police Board to many less visible, but equally vital posts such as the Commission on Disabilities, the Historic District Commission, and the New Haven Democracy Fund. The City is always looking for people to serve in these important volunteer posts. While there is generally no pay, the opportunity for civic engagement can be tremendously rewarding. Please take time to learn more about the various Boards and Commissions. If you find one that interests you, contact the chairperson and attend one of its meetings. If you decide that you are interested in serving, you can fill out the application (contact City Hall or www.newhavenvotes.org) and mail it to City Hall (Mayor’s Office, 165 Church St., New Haven CT 06510). You can either express your interest in one or more specific appointments, or the Mayor’s Office can identify an appropriate choice for you based on the information provided in your application. CURRENT LIST OF BOARDS AND COMMISSIONS See: http://www.cityofnewhaven.com/Government/pdfs/Commissions.pdf. The push for affordable solar energy in the New Haven area has gotten the attention from various companies and organizations. PosiGen, Grid Alternatives and SolarizeCT all offer programs that will help people get solar panels and greatly lower their electric bills. PosiGen, a solar installation company that specifically includes low- to medium-income homeowners in their target group, will be running a campaign in New Haven starting mid-January. PosiGen’s service includes a free energy audit. PosiGen recently started a campaign in Bridgeport, and has signed up close to 170 homes there, 50 percent of them low- to medium-income. The press conference announcing the beginning of its campaign in New Haven is scheduled for Tuesday, Jan. 12 at Neighborhood Housing Services in Building #3 of 333 Sherman Ave., New Haven. Please call Kathy Fay for details at (475) 227-0540. Grid Alternatives has met with the New Haven Energy Task Force and plans to come here in the spring. The City of New Haven is currently reviewing the Solarize New Haven proposal and, once approved, its campaign will also take off in our city. The New Haven Energy Task Force supports these campaigns and will help with their outreach efforts. These are exciting opportunities to bring solar power to New Haven residents, particularly those who may think that solar is out of their reach due to financial constraints. We do not specifically endorse any one company’s services compared to the services of any other installer. Interested residents should get quotes from alternative installers to compare service and prices. Before you sign any contract make sure the company answers your questions and explains the process so you know what to expect. Members of the Energy Task Force are available to answer questions about solar that residents may have. Please call me at (203) 562-2798 if you are interested in the process we went through when our solar panels were installed. Other news: The City of New Haven has officially re-instituted the Environmental Advisory Council. Its first meeting will be in January, the date has yet to be announced. Stay tuned on our Facebook page for more information or sign up for free email updates on this page. To date, Seymour’s post office remains inaccessible to elderly and persons with disabilities (PWDs) unable to climb its mountainous steps to the “public” lobby. It has succeeded in evading ADA compliance and enforcement twice. The U.S. Dept. of Justice claims lack of jurisdiction because this post office was built before ADA’s enactment in 1990. Then the U.S. Access Board determined it also lacks jurisdiction because the steps were constructed in 1917 and have not been altered since the 1968 enactment of the U.S. ABA. The postmaster refuses to re‑open the ramp at the rear where for years postal workers cheerfully provided services to anyone. A rally in May of 2015 at the Post Office in Seymour, Conn., shows the stairs, insurmountable to many, in front of the federal building. USPS has ignored my repeated requests that Seymour’s post office should publicize its rules applicable only to PWDs and that it should be required at least to provide signage visible to all customers unable to climb to the public lobby. Every year since 2012, Seymour’s town hall has assured me that by each year’s end or next spring work would begin to replace broken impassable sidewalks and to construct crosswalks and curbcuts. These promises remain unfilled. While new curbcuts have been constructed downtown, two are inaccessible because of steps in front of them, and another is inaccessible because the sidewalk leading to it is impassable. Also, curbcuts have been provided to access two brickwalks—but curbcuts are absent at the other ends enabling continued travel. Thus, dead-ends exist—25 years after ADA 1990. 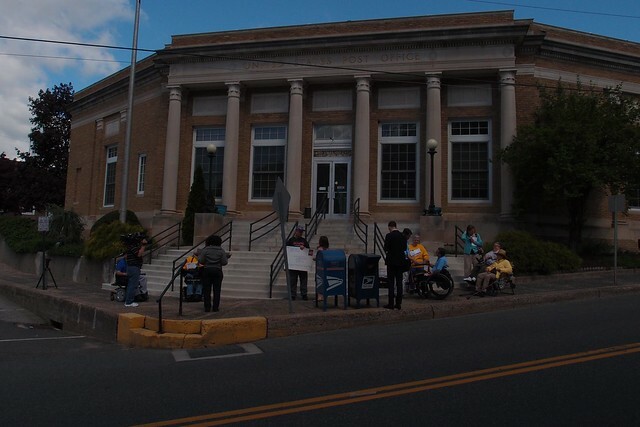 Again, I invite PAR readers to consider signing the petition to ensure architectural access at Seymour’s post office, all other public accommodations, and all state and local government buildings. Joseph A. Luciano, (203) 463-8323, DRAGconnecticut@yahoo.com. 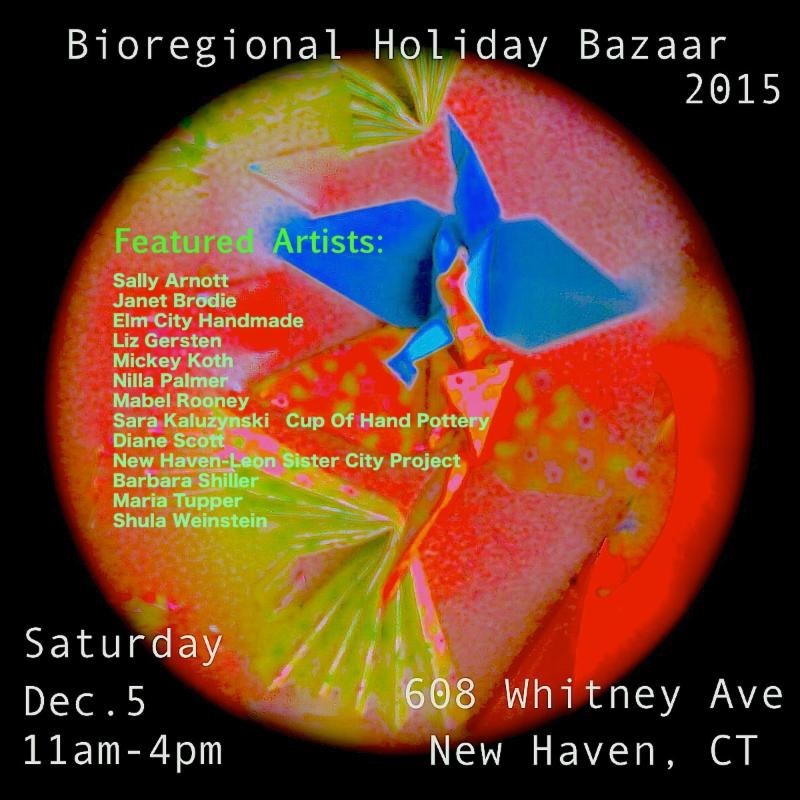 New Haven Bioregional Group Bazaar 11 a.m.-4 p.m. Dec. 5, 608 Whitney Ave. The bad news is that fracked gas pipelines exist and more are proposed all over the country. The good news is the same, meaning the front lines of the battle are everywhere, involving thousands of people – property owners, students, climate activists. Beyond Extreme Energy (BXE) was born in July 2014 when a group sat in and was arrested in D.C. at the Federal Energy Regulatory Commission (FERC), a quasi-governmental agency (funded by the industries that it regulates) that approves gas infrastructure, including interstate pipelines, storage facilities, compressor stations and super-high polluting liquefied natural gas (LNG) terminals. We have done three multi-day actions at FERC in the past year. From September 8-25, a dozen members of BXE conducted an 18-day, water-only fast in front of FERC headquarters, demanding No New Permits. Why a fast? Despite opponents attending meetings, speaking at public hearings, filing comments on dockets of proposed pipelines, carrying out civil disobedience in which hundreds of people have been arrested both at FERC and at various sites – all without having much of an impact – members of BXE determined that a fast would be a different kind of action and could reach the hearts of people in a way these other actions hadn’t. We distributed thousands of handouts and talked to hundreds of people, including FERC employees and even the chairman of the Commission. I provided logistical support for the fast, including driving the van, writing flyers and contacting the media. We all stayed together at night at a D.C. church. And we didn’t just sit around at FERC – we were very active in supporting other issues and events, like the culmination of the NAACP’s Journey for Justice from Selma to D.C.; a major press conference to support Bernie Sanders’s Keep It in the Ground bill in the Senate to end permitting for fossil fuel extraction on public lands; a climate-conscious Yom Kippur service at the Lincoln Memorial and events related to Pope Francis’s visit to D.C.
No, FERC didn’t stop issuing permits – yet. But we feel we changed the tone of the conversation, solidified our commitment to stopping fracked gas and its infrastructure, and mutually expanded our connections with many other groups like Black Lives Matter, faith-based communities, and climate justice workers around the country. For more information about BXE or groups in CT working on this issue, email me at Melinda.tuhus2@gmail.com.